Check out this awesome time-lapse video of the installation of Matthew Hoffman’s sculpture These Moments at Pitchfork Music Fest! Video by Zachary James Johnston. We will be posting some our Pitchfork Fest installation mentions and features over the next couple of days, so keep checking back! Here is one feature on WBEZ 91.5’s website. They posted our time-lapse video! 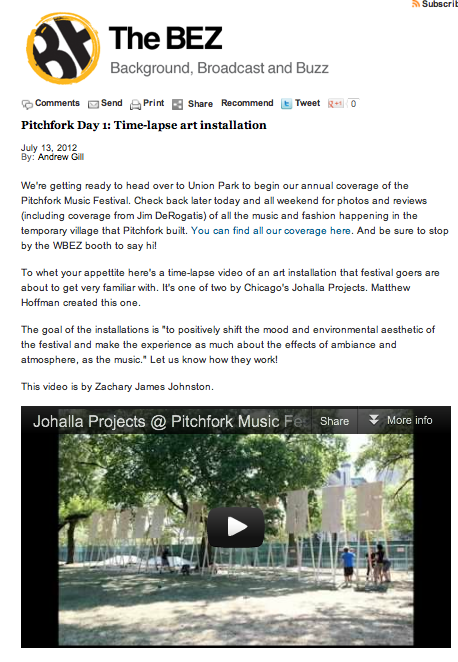 Get updates on our Pitchfork installations! Follow us on Twitter & Facebook to get the most up-to-date info and pictures during Pitchfork Fest 2012!